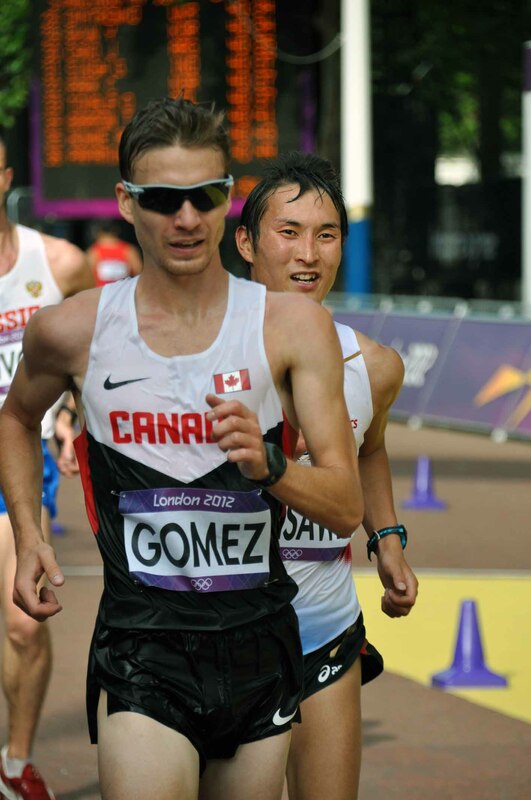 Athletics Canada has agreed to provide significant financial support to Canada’s elite race walkers for the 2013 season. This support will be made directly to the Racewalk West group. Racewalk West currently has 3 Senior Men qualified for the World Championships and for the FISU Games, both being held in Russia this year. The full impact of this support will be seen as the season progresses. The funding will be used to provide access to preparation programms that would not otherwise have been available. Artificial altitude simulation will be used in preparation for the Pan Am Race Walk Cup to help level the playing field with the Latin nations who live and train at altitude. All three of our athletes will participate in a multi week alritude camp in St. Moritz in preparation for Moscow. We will now have massage/physio therapy available to the athletes at all events and not just at the major team events. The group will also have access to professional biomechanics and gait analysis as both a prevention and a developmental strategy. The timing for this support could not have been better. The athletes and the Racewalk West coaching staff have progressed to the point where the skills are there to take advantage of the resources being offered. Thank you to Athletics Canada and the AC staff who have seen our ability to realise our potential and have decided to play an active role in our development. We will deliver on our part of the bargain. 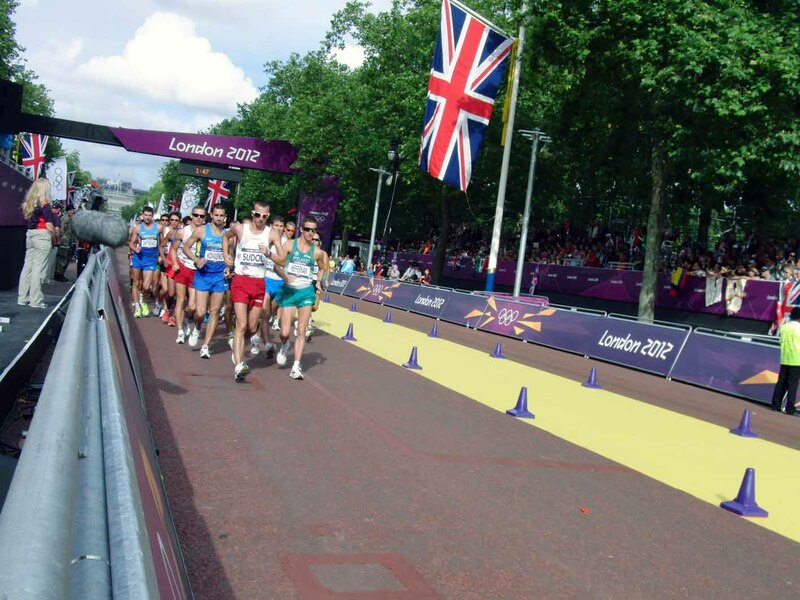 On March 17, Evan Dunfee and Ben Thorne brought Canada to the World level in men’s racewalk. Their 20km times of 1:22:46 and 1:22:49 put both of them into the Top 40 in the world. This is something that has not been done in Canada in over a decade. Combine this with the February performance of their teammate, Inaki Gomez, and you have a team of a quality that has never been seen before in Canada. Opening an ever widening lead within the first 100 meters of the race, with Thorne a few meters back, Evan paced himself masterfully. The pacing and patience that Evan showed in his debut 50km event in the fall showed itself once again in Huntington Beach, CA. By 15km Evan had steadily been able to increase the pace to the point where a personal best and World Championships “B” standard was inevitable. In the final 5km of the race Ben closed on Evan to briefly take the lead until Evan responded with a big push in the final 2km to lead Ben to the finish line with a 3 second gap. 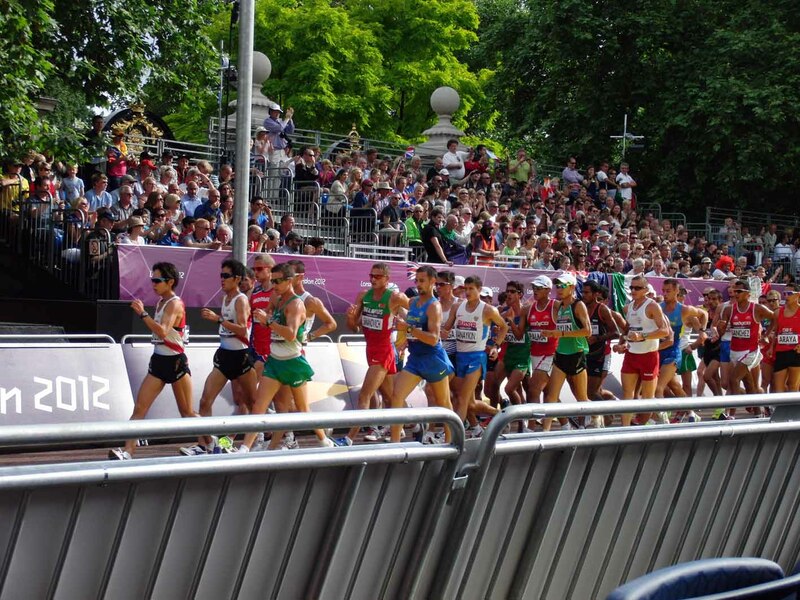 In the process the two Racewalk West athletes lapped the field on the 1.052km course with the exception of the third place finisher, Patrick Stroupe. The next challenge for Evan, Ben and Inaki, Canada’s best racewalking trio ever, will be the Pan Am Racewalk Cup which will be held in Guatemala on May 25. The trio, with the addition of teammate Creighton Connolley, are looking for personal and team podium finishes in the premiere event in the Western Hemisphere this season. They will then attempt to repeat the performance, representing Canada at the FISU Games in July in Kazan, Russia before heading for the World Championships in Moscow in August. Gomez has the “A” standard and Thorne the “B” for the 20km event and Dunfee has the “B” standard for the 50km event. Now that the three are becoming familiar with view from the podium at World level events podium finishes at the World Championships and the Olympics are not many events away. Prior to arriving in London for the Olympics we were told repeatedly that the Olympics were different. How different could they be? It’s still a race walk. The rules don’t change. The course is a loop. We’ve seen all of the competitors before at other international meets, we’ve even seen most of the judges. What could be different about that? Well, after having been though our first one I can honestly say, just about everything. We started to see the differences days before the event. the course walk-through was actually not a walk-through at all. For the most part it was a walk-beside. For half of the course nobody could walk on it, only beside it. For the other half of the course those without full accreditation could not even see it except for at a great distance. The course was guarded by military personnel 24 hours per day. It was so unique that I would have taken a photo except that I was told by the folks in uniform that both myself and my camera would be confiscated. It was interesting to talk to the lads though. Seeing that we were from Canada they nearly all could tell us about their stay in Canada at the UK exchange base in Alberta. The way that the course was set up half of the route was accessible and half was enclosed in a secure area that only ticketed or accredited folks could enter. The secure area contained all of the features that we need access to during the race except for the personal drinks station. We found out about this 10 days before the event. We informed Athletics Canada staff that at least one of us would need a pass to be able to do our job. Lots of promises and much discussion later, come race day we had no pass and no access. Luckily, Carmen Alvarez, Inaki’s long-standing (and long-suffering) partner came to the rescue. Through contacts that she had she rustled up a “magic” pass that not only allowed me to get in but allowed me to go almost anywhere I wanted. Thank you Carmen! 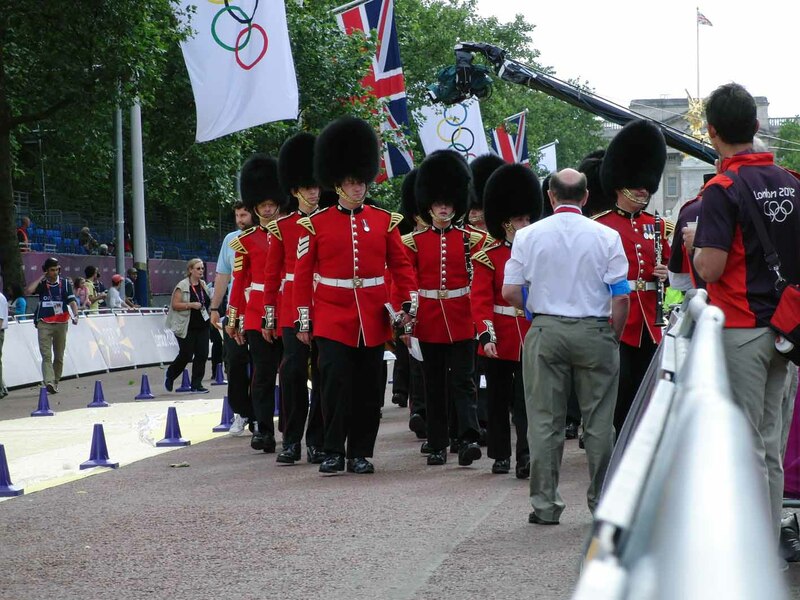 I suppose that the prelude to any event that takes place in front of Buckingham Palace would not be complete without a visit from the Queens Guard and the boys in the band. We were treated to, among other classics, a rousing rendition of Queen’s “Don’t Stop Me Now”, which was both pleasant and fitting to the situation although odd to be coming from this band. Using my magic pass I found a great spot just beyond the Finish line. I was joined at my little perch in front of the main stands by the Gomez-Goroztieta clan and friends. What at first seemed like a questionable idea form an athlete/coach perspective, having all of that distraction in our faces, turned out to be a game saver. We were in the only area on the entire course that was accessible to “persons needing assistance”. That’s where the abuela (Spanish for grandmother) comes into the picture. Inaki’s grandmother is a “person needing assistance” and also, I found of later, a “person of great resistance”. The event staff did not want us cluttering up media sight lines and came down to move us along. Even though she has little English, the abuela cottoned to the situation and sat stony faced and silent and refused to move. 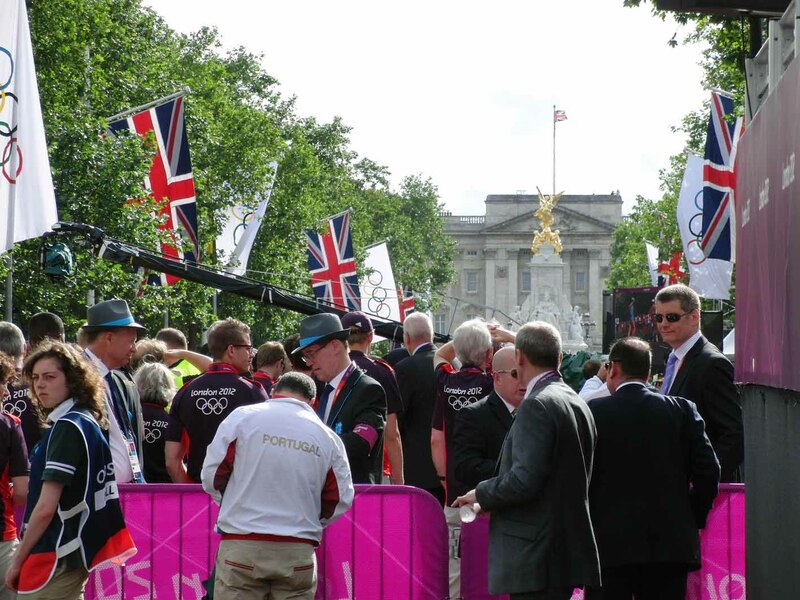 The event staff, being true Brits with full respect for elders, were stymied. As a compromise they gave us boundaries that we could not go outside and every once in a while came by to see if we hadn’t considered moving along. The event staff quickly and effectively removed all others who dared venture into the sacred space until, later during the race, the Irish moved in. They event staff didn’t even bother coming by to talk to them, there was no way that they were going to mess with the Irish as, by now, they know that it always turns out badly. OK, so with all that going on the race got underway. Finally, we came to a point in the race where things again became familiar. Because of the slow start the pack was very dense and everyone inside the pack had little to no room to move. This went on for a full two laps of the race until the boys at the front de cided that the race was on and the pace picked up spreading out the field. The rest of the race unfolded as we expected with Inaki picking up with a pack that was travelling at his pace. At about 13km the pack started to slow down and at 16km I gave Inaki the signal to break away and get moving, that Canadian record was not going to wait for him. He was immediately able to respond and pulled away with only one other member of the pack going with him. That little boost made the difference and he crossed the line with a brand new Canadian record for his Olympic debut. Thank you all, we do appreciate what you do for us.